Today we’re trying something different–a joint book review of The Man Who Walked Between The Towers by Mordicai Gerstein. 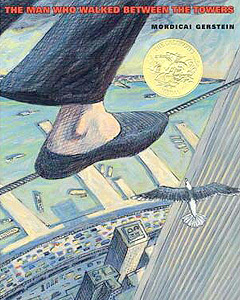 This Caldecott Award winner follows the true story of Philippe Petit’s historic tightrope walk between the World Trade Center Towers. It’s 1974, and construction of the World Trade Center is nearing completion. Enter Philippe Petit, a street performer. To him, the gap between the two buildings would be the perfect place to walk a tightrope. With a beautiful progression of illustrations, including some fold out pages that enhance the height of the towers and of the wire, the story follows Philippe as he faces numerous challenges in attempting his goal. Joanna: My five-year-old son Karsten frequently requests this book at bedtime, and it is a joy for me to read. Part of the appeal is my connection to New York City and the WTC Towers themselves. Growing up outside New York, they were an iconic part of my childhood. I’ve been up them only once–a few months prior to the 2001 attacks. This book is a wonderful commemoration to Petit’s feat as well as to the WTC tragedy and the spirit of New York. It’s also a great story about having a dream and making it come true against the odds. Katie: Interestingly, my kids had different reactions to this book. They did not know anything about Philippe Petit, so as he planned his walk between the Twin Towers, the suspense kept building. They were both asking, “Does he make it?” There was a sigh of relief once he did. My four-year-old daughter was a little too afraid of him falling to enjoy the middle of the book, but my son was thrilled to find out how it turned out. If you want to delve even deeper into Philippe Petit’s life and his accomplishments, a full length novel is available. In the current printing it is called Man on Wire, and before the documentary it was called To Reach the Clouds. Philippe Petit himself penned several books about his life as well. If you’re a teacher, here’s a lesson plan from Scholastic. Or if you watch BookFlix (available through your public or school library), there is a nice read aloud of the book. Welcome to the new and improved blog! Last October, we asked you what you most wanted to see on the blog. A third of you told us you most enjoyed the book reviews, with interviews and writing advice coming in a close tie for second. Joanna and I also discussed what we liked about other blogs and investigated some updated features. So today we are proud to announce the re-launch of A Life Spent Reading! We’ve begun incorporating your feedback on content, added new functionality and updated to a fresher, cleaner look. We hope you like it! If you are an email subscriber, click over to the site itself to have a look. The contest ends on Friday, January 29th. Chains follows Isabel, a young slave, on her quest for freedom during the Revolutionary War. I admit it took me a few chapters to embrace the story, but once it picked up (or once I wasn’t distracted by life, really) I was entranced. Anderson made the American Revolution come alive through her attention to historical detail and skill at weaving believable fictitious characters and desires with historical events. I loved the characters–especially Isabel and her sister Ruth. Isabel is looking for freedom, and she’ll side with whomever she thinks might help her attain it. This wonderful middle grade novel would provide ample opportunities to talk about race, freedom, and our nation’s history. 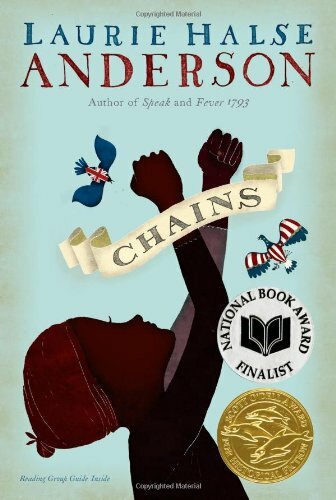 Chains is the first book in Anderson’s Seeds of America Trilogy. The second book Forge received this review from Kirkus. Some readers might find it “one of the best novels they have ever read.” What a statement. I’m heading to the library today! The third installment in the trilogy, Ashes, has not yet been published (as far as I can tell). For readers capable of appreciating mature topics such as PTSD or eating disorders, Anderson has a wealth of novels, including Wintergirls, Speak, and the recent The Impossible Knife of Memory. All amazing. New Years Follow-up: Katie shared her goals and inspirational word for the new year in last week’s post. My word is courage. Now that I’ve finished my MFA (!) I need to take some risks. Whether it’s finishing the revision of my current work in progress or submitting said revision to agents, I’ll need to adopt an assertive attitude toward what comes next. Here’s to a courageous 2015! I am pleased to announce that Joanna has officially graduated with her Masters in Fine Arts from Lesley University! She has invested 2 years of hard work, which went by amazingly fast (she may disagree with that last part). The other member of our critique group, Anne, and I are so proud of her. We are excited to see where her writing career goes next – it will certainly be to wonderful places. Happy New Year! 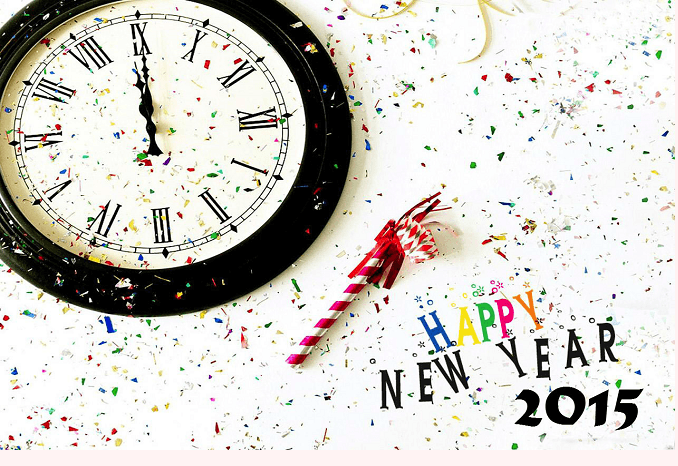 We are now 9 days into 2015, and most of you have probably thought about resolutions, goals, or other plans for this brand new year. I love the idea of a fresh start, even though it’s a bit arbitrary. Spring also feels full of new opportunity to me, so perhaps in March if you look back and find that things have not gone as planned for the first few months, you can update and tweak your plans. I am a believer in setting goals. Not too many, because then I will get overwhelmed and try to focus on too many things at once. I have three main categories for my goals – writing, fitness, and personal. In each category, I have 3-5 goals. I try to make them as measurable as possible, so I can legitimately celebrate when I get there. Some of my goals include Get an Agent (= rewrite the first chapter of my finished novel + send out my manuscript repeatedly), learn/re-learn to knit, and earn a 5K race time of under 30 minutes. Wish me luck! Perhaps goals or resolutions don’t work for you, or you want to take a different approach this year. Perhaps you are looking for an overarching theme for everything you do this year. When Joanna and I were discussing this subject, she proposed taking a One Word approach. The idea is to use one word as your guiding principle – words like Believe, Forgive, Dare, or Simplify. It could even just be Write! If I were to choose one word to guide my year, I might choose Soul. I want to focus my choices on those things that feed and nurture my soul. While there are things that I have to do that are neutral on my soul (certain kinds of work, perhaps? ), it gives me permission to get rid of those choices that are life-suckers and drag me down. Why make time for that? What are you goals, resolutions, plans or one word for 2015? Please share in the comments! We’d love to hear them.